Montréal: an igloo in winter becomes a piñata in summer, with the party playlist provided by both the famous and those "playing real good for free" at festivals of African drumming, jazz, electronica, rock. 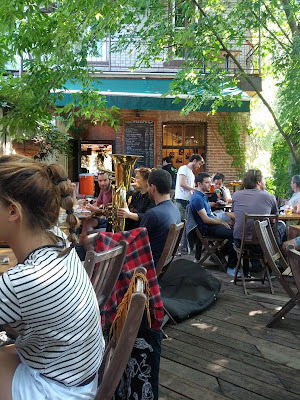 The city felt like revolving, impromptu cabaret: in a single day, a jazz trio performed on a terasse, a tango club danced in the park, a jug band thumped at the subway, and the musicians, at left, offered an impromptu serenade in a bar. They obvioulsy aren't a bar band. 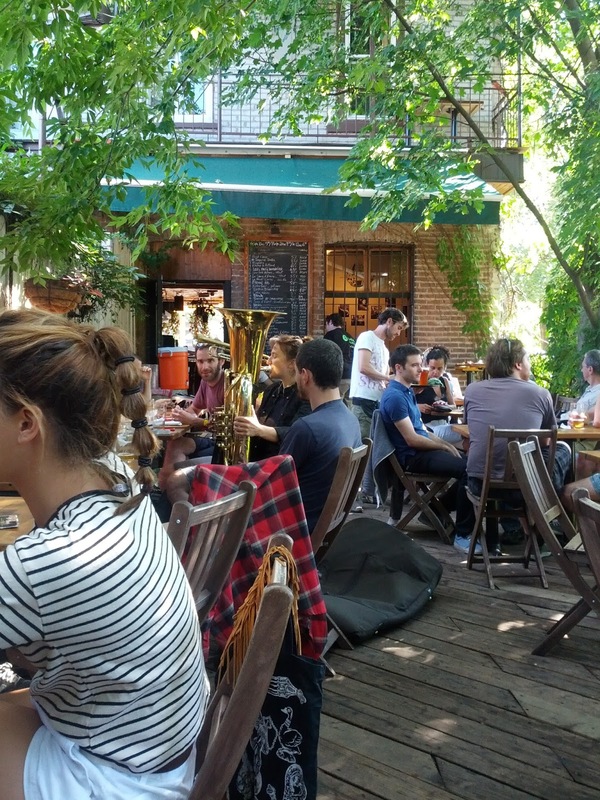 We wondered, who stops by for a beer with his tuba? The Grace Kelly exhibit at the McCord Museum displayed her haute couture wardrobe (including a well-used Kelly bag), letters and portraits. My friend Judy thought Her Serene Highness's dresses traced an arc from elation to depression. The real Grace remained hidden behind the perfection of her image, despite the show's title, "Beyond the Icon". I took a painting course, in French. My first effort, this rose, was an exercise in form, colour and patience. When our friend Bernard heard about my efforts, he gave me the generous gift of art supplies he'd inherited, including a burled-wood palette so patinaed with paint and wear that I'll display it, in memory of his friend Michel. I met a gifted "real" artist, Beth Adams, who shares her work on her blog, The Cassandra Pages. She shows her watercolours and sketches, among other marvels. For a time, she completed one drawing every day, and so exquisitely. Beth sings, gardens, sews, teaches meditation, owns a small press and graphic design business, and paints. She writes eloquently, bringing her eye and nuanced appreciation to The Cassandra Pages. When Good & Company held a sale, it was time to choose a supple, airy chiffon scarf as my "Hello, 65" gift. 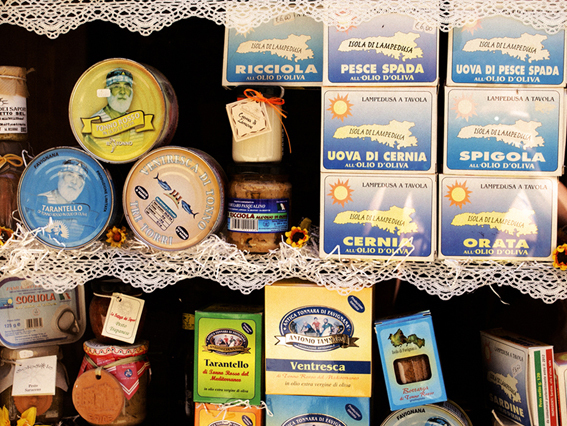 Since we live in Little Italy, "Sicilian Specialities" is right at home. Which photo below is the scarf and which an actual display in a store on my street? I wasn't the only summer birthday! Our twin sons turned 26. Friends and family joined them and Etienne's sweetie, Tash, whose birthday was the day before, to celebrate with a backyard party. What's better than Montréal in summer? Montréal in fall, when every last drop of light, every turning leaf is precious. On Our Lady of the Harbour..."
sang Leonard Cohen in "Suzanne". He was writing about this place, and, I like to imagine, this time of year, when we hoard the handful of remaining golden days before the deepening shadows of fall. I hope you, too, have sunny summer souvenirs. Thank you for returning! So good to have you back, Duchesse. Your Montreal summer reflections are lovely. I'm glad to hear that you had a wonderful summer! We're still having it down here in Dallas, but were spared terrible heat this year. It's good to have your blog to read again! I've become a scarf person thanks to you and others who write about them. i love Montreal and it looks like you had a special time! I can dream of fall in Montreal and maybe it will make the heat more bearable. Welcome back! What a wonderful post, capturing the flavor of your city. The scarf is fabulous!! Now I want to visit Montréal more than ever. Enjoy your beautiful autumn weather. Glad to see your post pop up this morning. I think your scarf is a great choice...what fun! Enjoy the subtle change of season as fall cloaks you with cashmere. Welcome back Duchesse! That scarf is amazing! Welcome back! Wonderful to have you around again. And looks like a beautiful summer. It is good to have you back. I too love our Montreal summers when everyone is on the street or the terrace. The pace of life here is different from anywhere else in North America. I was delighted to have your post appear this morning. It looks as though you had a summer of learning experiences. Your rose is lovely. Are you really 65? The new scarf is elegant. Bonne rentrée. I really must get back to Montreal, but meanwhile, you bring it alive here so wonderfully! Impressed that you took art classes in French! Now that's immersion! And your artist friend's website is wonderful -- I'm definitely adding this to my Reader. Looking forward to more Montreal posts from you -- welcome back! Swissy- So good to see your name again. There will be more about Mtl. Susan: I made a new friend this summer; she's from TX (Dallas) but they spend summers in Montreal. Pam: We had some 36C days this summer, if that helps! Pseu: You'd be warmly welcome! hostess: And I shall be back reading you, too. Patricia: Thanks. Chiffon so have to be careful about snags. LPC: Quite the summer for YOU, too! Araminta: It's hard to describe to someone who's never been here- it's slower but at the same time there is a hum in the air. 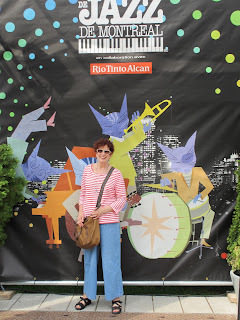 materfamilias: So happy to 'introduce' you; Beth is a woman of many talents, as are you. 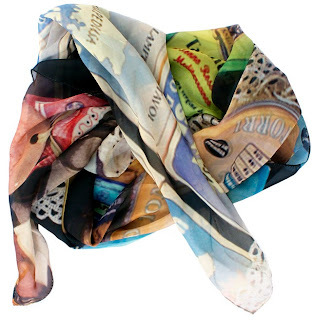 Have you worn your "Sicilian Specialities" scarf to Fruiterie Milano yet? I believe I espied Le Duc on his bicycle heading east on St-Zotique, but I was going north on the cycle path to meet friends at the market, and didn't want to miss my light. 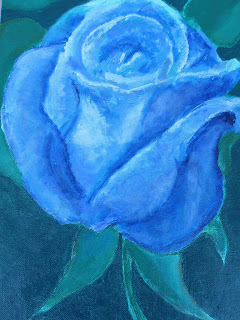 Cassandra's blog is inspiring; I've been having a hard time painting of late. pseu (une femme), in general, we have lovely autumns. Nicer than in France. Their springtimes are more pleasant than ours. And of course the twins are lovely young men! Oh so nice to have you back! I'm excited to make my first visit to Montreal next month and reading your posts will help with the wait. I love your postcard inspired post: brief yet all encompassing snapshots that conveyed all the sights, sounds and aromas of a Montreal summer. So glad you are back. I started looking for your posts a couple of weeks ago, hoping you would start early! Wonderful first post after all those weeks. So happy to have you back. Unfortunately, our summer did not include a trip to Montreal, but I can live it vicariously through your post. However, sometime in the spring, I will return. It has been too long. lagatta: Yes, he rides his bike often, around the neighbourhood. Wendy: Please stop by to tell us about your visit! coffeeaddict: A lot of the aroma is...coffee. Indy espresso bars seem to be opening by the week- is there no limit? barbara; Those $15 (on sale) Lands'End striped tees were worn often. Kristine62: If you can pick the time, wait for May; April can include snow and be cold and rainy. It doesn't get nice till May. So good to have you back, I've missed you and your bright eye on Montreal. And what a gift to see that you've linked to my blog - thank you so much! Meeting you was a highlight of my summer, too,and I look forward to more shared creative adventures! Welcome back, Duchesse! Glad to hear you had a wonderful summer, and very impressed by your artwork. Autumn always reminds me of the start of the school year at McGill (where I did my bachelor's degree). Looking forward to your upcoming posts. Yay, you're back! Sounds like a lovely summer. We've had a fantastic summer in England - months of beautiful weather has made all the difference. Beth: Many readers are- or aspire to be- artists and will enjoy The Cassandra Pages. Louise: And I have visited your newly restyled blog! Congratualtions! birdybegins: Your welcome means a great deal to me. Had to muster some energy to come back to blogging; it is work. Welcome back! and what lovely reflections on a summer. And than you also for the link to your friend's blog -- such a treat. That first photo of you is fab. And your two sons are so handsome!